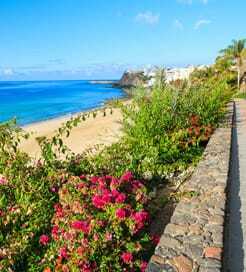 There is currently just the 1 ferry route running between Fuerteventura and Lanzarote operated by 3 ferry companies – Fred Olsen Express, Lineas Maritimas Romero & Naviera Armas. 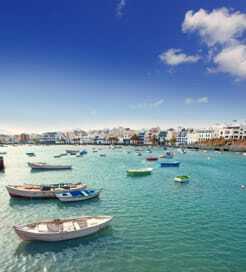 The Corralejo to Playa Blanca ferry crossing operates daily with a scheduled sailing duration from about 25 minutes. Whilst we’ve taken great care to ensure the information on this page is correct, as the frequency and duration of crossings on all routes can vary from time to time we’d advise that you get a live quote for current availability on this Fuerteventura Lanzarote crossing between Corralejo and Playa Blanca. Fuerteventura is the second largest of the Spanish Canary Islands in the Atlantic Ocean, situated off the northwest coast of Africa. Declared a biosphere reserve by UNESCO in 2009, Fuerteventura is blessed with the archipelago’s most stunning beaches, a ruggedly beautiful landscape and over 3,000 hours of sunshine each year. It has also long been admired as a top destination for visitors interested in cultural heritage thanks to its large number of centuries-old mansions and beautiful churches. Fuerteventura has a large number of ports along its coast, making it an excellent departure point for the rest of the Canary Islands. Also, with the routes operated by a range of excellent ferry companies, there’s no shortage of sailing options.